Couldn't be happier. Bought this to match one in my dining room. Nice quality and the colors are perfect for my living room which is open to my dining area. Takes a fews days for the rug to flatten out from being rolled but a rug pad helps speed that process along. Also, the “green” is actually more of a dark teal which worked out even better for me. 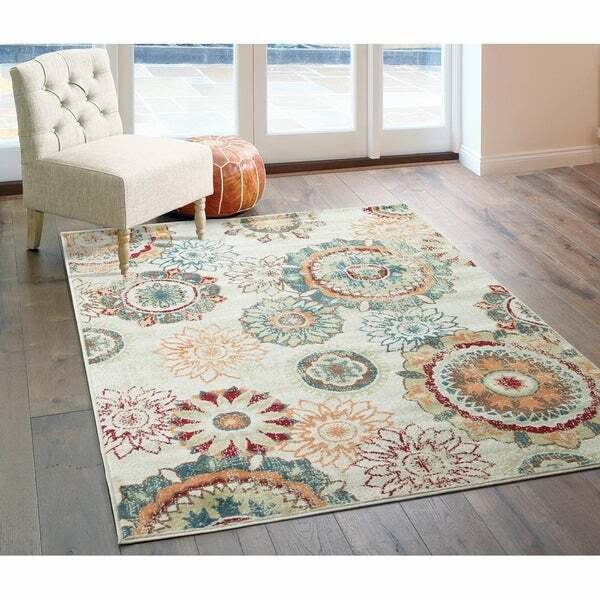 Give your living area bohemian appeal with the floating floral medallion themed design of this exquisite rug. The stain-resistant quality of the rug's 100-percent polypropylene weave allows for simple care and stress-free use. Dimensions 120.08 In. X 94.49 In. X 0.35 In.